Reviewed by Zoë Shacklock . Opening with the famous refrain from W. B. Yeats’s ‘The Stolen Child’, Song of the Sea invites the audience to embark on its magical, yet somewhat melancholy, voyage through the natural and cultural landscapes of Ireland. The film’s exquisite hand-drawn animation is enchanting, slowly unfurling in kaleidoscopic patterns that will leave audiences of all ages spellbound. Yet Yeats’s solemn conclusion echoes throughout the film, as director Tomm Moore combines the story of a grieving family with the Irish myth of the selkie to weave a surprisingly sombre tale of grief, loss, and belonging. 10 year-old Ben lives with his younger sister Saoirse and father Connor in a lighthouse on a small island off the coast of Ireland. Ben’s selkie mother Bronagh disappeared into the waves on the night of Saoirse’s birth, leaving the family grief-stricken. When their disapproving grandmother decides that the family is not coping, the children are sent to Dublin. Yet Saoirse rapidly and physically sickens away from the water, and the two children must embark on a desperate journey back to the sea. Recurring visual motifs draw firm links between the humans, the magical characters and the landscape, brimming with the promise of metamorphosis. Yet the animation tends towards the geometric rather than the fluid or protean, recalling both the patterns of Irish folk art and the work of Paul Klee. The animators make heavy use of bilateral and radial symmetry, which, combined with the slow pace, makes for an almost hypnotising experience. Nature, human, and narrative are all built upon repeating patterns, reiterating the film’s concern with the deep connection between people and place. The soundtrack, a collaboration between French composer Bruno Coulais and Irish folk band Kíla, does a lot of the heavy lifting in terms of both tone and narrative. The four-note motif that represents Saoirse’s connection to her mother has more narrative agency than many of the human characters. Directly contrasting with Saoirse’s muteness and Connor’s grief-stricken silence, the lyrical leitmotifs overflow with emotion and meaning, and hold the episodic structure of the film together. The film does ensure that it addresses its younger audience members. Ben’s dog Cú is a key site for attachment, the sibling rivalry is instantly relatable, and the humorous fairies encountered in the film’s middle act are a welcome break from the elegiac tone. But the laughs are few and far between, and even the film’s villain resists black and white classification, foreclosing any easy triumphs. Instead, the film suggests that the true villain is emotional repression, and the boundaries we erect between ourselves and the world around us. It is a serious topic for a children’s film, but is treated with the gravity it deserves. The film never explains the mythologies it draws from, and audiences unfamiliar with Irish folklore may at times feel excluded from accessing some of the deeper meanings. Yet this also works in the film’s favour, for privileging the abstract over the expositional demands a personal engagement with the subject material. This makes the film more accessible than Moore’s previous feature, the narrative-heavy The Secret of Kells. 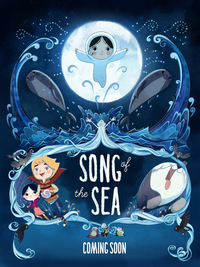 If, like Saoirse herself, the film seems to defy language, then it does so in order to speak to us in other ways: through the beckoning, mesmerising call of the Song of the Sea. This review was published on July 19, 2015.